Bengaluru: When Iceland, the smallest nation to play in the World Cup (pop: 350,000) held Argentina to a 1-1 draw on 16 June with defensive tactics and physical strength, it could be explained away by diehard believers as an aberration. Then came Thursday’s 3-0 rout by Croatia. This was different—the Croatians played open, attacking football, true to their Slavic tradition, to crush the 2014 World Cup runners-up. Fans who kept the faith—and there are millions around the world—should have read signs of the impending abject capitulation when five-time-footballer-of-the-year Lionel Messi walked out with furrowed brows, the weight of the world on his shoulders. Eyes downcast, he massaged his forehead as the national anthem played. If that was a portent of what was to come, it was accurate. Manager Jorge Sampaoli appeared to have a plan—for a continuation of the game against Iceland rather than a new opponent. He reduced the number of full backs to three and pushed his men forward—a tactic more suited to counter a defensive team like Iceland. Against Croatia, who combine well with passes and make swift attacks, this backfired badly. Sensing a fragile back, the Croatians mounted raids down the flanks. This forced the four Argentinian midfielders to fall back, thus negating Sampaoli’s idea of pushing forward with numbers. It also meant Messi was left twiddling his thumbs for much of the game, a hapless spectator to the mess at the back. The Argentinian full backs are no mugs—they play for major European clubs. But they looked confused, trying to adjust to the change in formation. Instead of moving forward to feed the midfield and forward lines, or just clearing the ball, they took crazy risks passing the ball about for possession at the back between themselves and goalkeeper Willy Caballero. It almost resulted in a goal in the first half. The Croatians sniffed blood and charged the backs and goalie at every opportunity. This finally induced a schoolboy error from Caballero early in the second half. He tried to chip the ball over a Croatian forward for a return pass to fullback Gabriel Mercado instead of simply punting the ball midfield. Ante Rebic accepted the chip with glee and slammed a volley past the goalkeeper for Croatia’s first goal. Caballero looked ill at ease in both games and confirmed the worst fears of critics who questioned Sampaoli’s decision to pick him over Manchester United goalkeeper Sergio Romero. After a knee surgery to fix a displaced cartilage—an old injury—Romero had said he would be fit in time for the World Cup. But Sampaoli insisted he wanted a goalkeeper who could train with the team in the run-up to the tournament. Sampaoli’s histrionics on the sidelines conceal his role in the debacle. His substitution of Sergio Aguero with Gonzalo Higuain for fresh legs in attack was knee-jerk. Aguero had kept the Croatian defence busy. 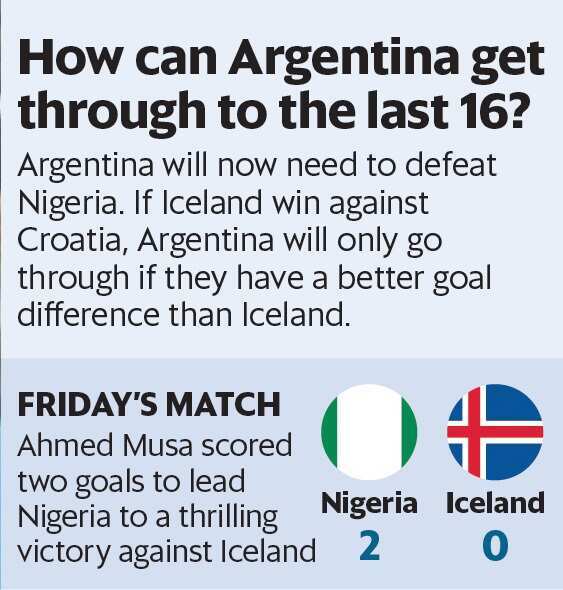 A smarter play may have been to move Messi back into the role of playmaker, like he did against Iceland, and keep both Aguero and Higuain as finishers. In the event, Messi’s body language showed something was amiss. The manager, captain and players appeared out of sync with one another. The Barcelona star had bid goodbye to the national team a couple of years ago after Argentina lost three finals—the 2014 World Cup and two Copa Americas. He was persuaded to change his mind and return to international football. It did get Argentina to the World Cup with a Messi hat-trick against Ecuador after a dismal qualifying campaign. But mostly, a Messi-centric approach has failed to bring out the best in the many other talented players Argentina supplies to club football. Most of Argentina’s attacks flounder in a crowded midfield around Messi. He’s quickly hemmed in by defenders when he has the ball, and when he creates an opening for others, they’re just not on the same wavelength. In the end, after a panic-stricken flurry from Argentina, Real Madrid star Luka Modric put the issue beyond doubt with a 25-yard curler around a defender and past Caballero. The third goal was just the final humiliation: Messi’s Barcelona teammate Ivan Rakitic slotted the ball home even as two defenders simply stood and waved to the linesman for an offside. Perhaps it’s time to celebrate new stars on the firmament instead of shedding tears for an Argentina in shambles.